Testing with saliva is more sensitive than traditional blood testing because blood tests look for food allergies, which are actually rather rare. Most pets (and people) suffer instead with food sensitivities and intolerances, which are a different kind of problem from a true food allergy. Nutriscan is the only clinically predictable diagnostic test for dogs, cats and horses to identify the commonly seen food intolerances and sensitivities in saliva. The Nutriscan test is patent protected in the United States and internationally with scientific backing. Food intolerance or sensitivity is actually quite common whereas food allergy is rare. In fact, food intolerance is the third most common sensitivity condition in dogs and often can be easily remedied with a change in diet which is why Dr. Jean Dodds DVM developed the Nutriscan test. For years, though, the difficulty lay in figuring out what foods were problematic — until now. 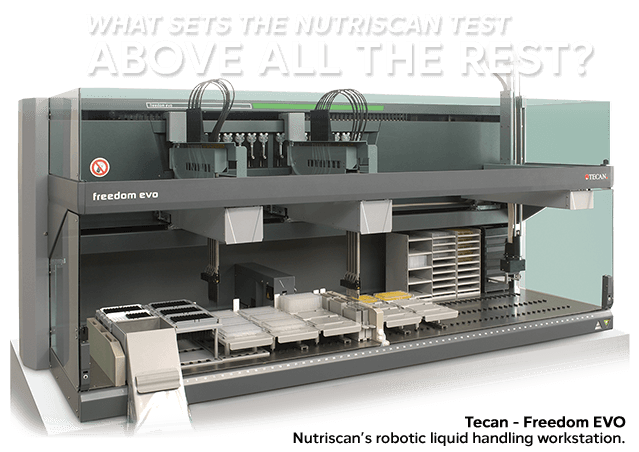 What does NUTRISCAN test for? This test measures antibodies to certain foods in dog saliva. High antibody levels indicate that the dog has a food sensitivity and intolerance to that food or foods. It is not a DNA test or a cheek/gum swab test. In fact, food intolerance is the third most common sensitivity condition in dogs and often can be easily remedied with a change in diet. 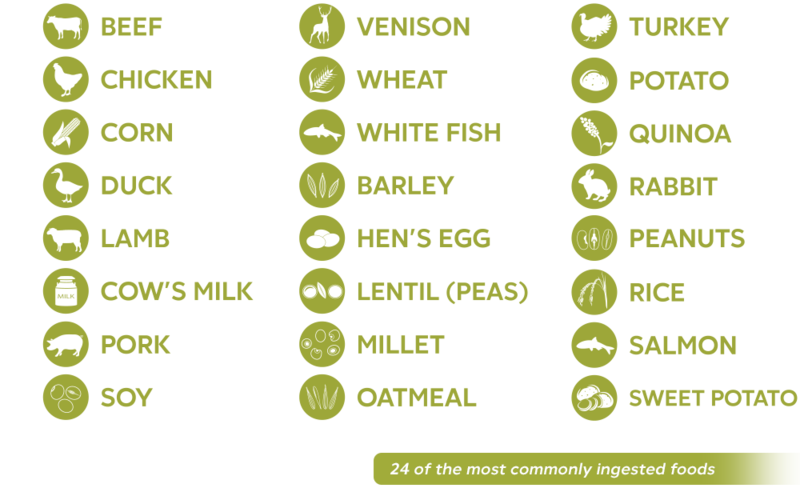 NutriScan tests for the twenty-four most commonly ingested foods to provide you with specific results. Since it is a salivary test, you have the convenience to complete the test at home, at your local pet store or at your veterinarian’s office. Best of all, you can have the results in approximately 3 to 10 days to help you put your dog on the right diet. The test measures the levels of IgA and IgM antibodies in the saliva. These antibodies are produced by the body in order to fight food sensitivities, so they offer the perfect measure of a reaction taking place. In fact, a food intolerance can lead to one of these antibodies showing up in the saliva as early as five months before bowel disease shows clinical symptoms. And, sometimes these antibodies can show up in the saliva without even appearing in the blood. Your pet should overnight fast before testing. Place cotton rope in dog’s mouth at corner of jaw and allow dog to chew on it for approximately 2 minutes. Hold free end firmly, as shown. If needed present dog with a treat but do not feed. This will promote salivation. Insert wet end of cotton rope into Inner Tube; CUT rope end so that rope fits into Inner Tube; discard the cut-off portion. Place cap securely on Outer Tube and tape shut. Completely fill out the Pet ID on the Outer Tube and the Test Request Form. Place filled tube in the Nutriscan prepaid* envelope along with completed Test Request Form. Place it in your mailbox and you are done! *Available within the United States only. As opposed to food elimination diets that can take weeks and even months to attempt to figure out the offending food or foods, NutriScan requires only that a small piece of cotton rope (provided in a kit) be inserted in your pet’s mouth for a couple of minutes. After the kit is submitted by you, your pet store or your vet’s office, you’ll have the results back in only weeks. By contrast, cheek swabs alone do not generate sufficient biological fluid to quantitatively determine specific food reactivities. Simple positive or negative results, for instance from tissue swabs, do not provide information about the specificity or sensitivity of the food. Therefore, selection of foods based upon this type of information is medically and scientifically unreliable. Dr. Jean Dodds, DVM, a veterinarian for 50 years, has a worldwide reputation for being at the forefront of veterinary science, clinical research and animal welfare; she has 25 patents, and has authored numerous scientific papers, book chapters and two books. She moved from upstate NY to southern California in 1986 to start Hemopet, the first non-profit national animal blood bank. Today, Hemopet’s range of nonprofit services also include specialized diagnostic testing; consulting in clinical pathology; and teaching for animal health care professionals, kennel clubs, and pet owners on a variety of subjects including nutrition and holistic medicine. Her drive to help pet parents identify their pet’s food sensitives is what lead to her invention of the Nutriscan diagnostic test. Ready to order your Nutriscan Food Intolerance Kit?